Several weeks ago, we had an article that taught us how to restore sane browsing configurations in Firefox 4 after switching over from Firefox 3.6, including look and feel and addons compatibility. Now, we will talk about several more tricks and changes that should make your Firefox 4 experience even more pleasant. This is a new feature in the fourth release. It allows you to sync your browser data with a remote server, allowing you to restore your stuff in case you browser profile gets corrupted or deleted. The beauty about Sync is that it allows less knowledgeable users to keep their data safe in a simple, fire-and-forget manner. Moreover, syncs happen in the background, seamlessly, allowing for a very pleasant, non-intrusive experience overall. It is important to note that there are many backup options available. First of all, you can simply copy your entire profile. A scheduled job ought to make it a transparent procedure, with frequent checkpoints. You could also use a backup software to manage the backups, including using only incremental and differential snapshots to conserve space. 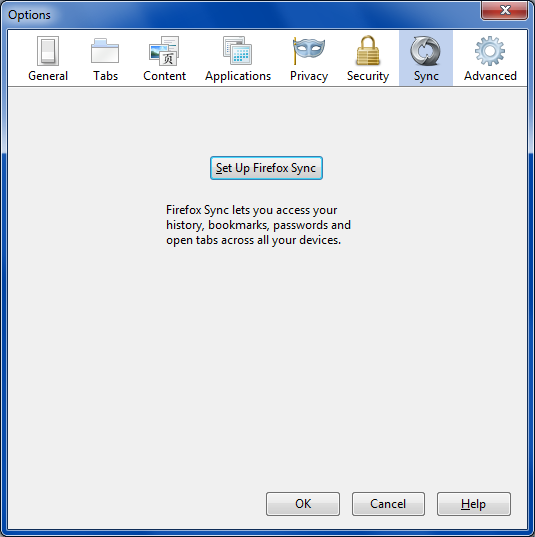 Then, you might also want to use dedicated Firefox backup extensions like FEBE and CLEO, to preserve your browser data. Combined with a proper schedule, you will have a robust backup strategy in place. For more about useful Firefox extensions, please consider reading my must-have list and how to manage add-ons in a centralized manner. 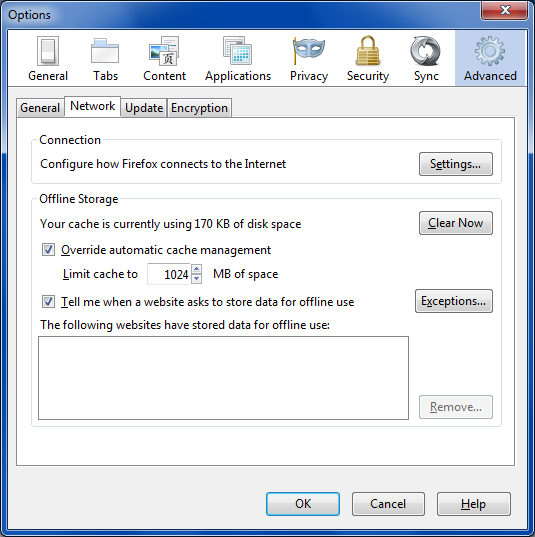 In older versions of Firefox, the cache was limited to 50MB by default. Firefox 4 removes the restriction and permits an unlimited cache, which kind of stands to logic with high-definition video streaming, but it could also blow up your hard disk. This is a funny reversal of ideologies. Older versions of Internet Explorer used to run with generous multi-GB caches, which were completely unsuited for days back then, causing a big performance penalty. Today, Internet Explorer is more modest. Firefox started humble, but now it will eat your disk like Kobayashi. You should settle for an intermediate value, like a few hundred megabytes or alike. 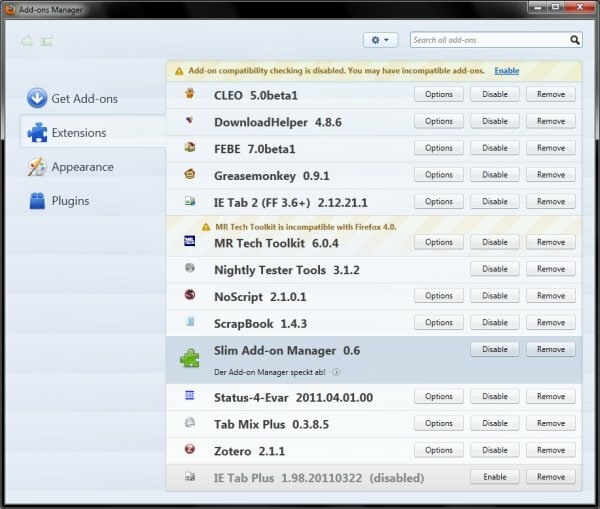 You may get this problem; if you have too many extensions installed, the Add-ons Manager window will be too large, or rather too high, whether maximized or not, with the top part inaccessible, expanded beyond the size of your screen. You could try playing with the resolution, but this is only a dirty workaround. You want the Add-ons Manager to display properly. No worries, that is what Slim Add-on Manager extension does. It will make the Manager window much smaller and, more importantly, scale it down to match your resolution. Well, I guess I'm not the only one with this issue, as someone thought about this already. The only problem is that the extension description reads in German. Now, I'm one of the few privileged people not to be afflicted by this phenomenon. In the worst case, I can vaguely remember some issues with Firefox 1.5, but not since. You may have had the problem and gotten on top of it, but now a fresh major release resets the scales of doubt. If you suspect your spank-new browser is leaking, you might want to conduct a bit of a research. There are many ways to do this; use various performance tools, parse the Firefox PID memory maps under /proc in Linux, poll the process table every once in a while, browse the Task Manager, look for clues, etc. And there's a simpler way. 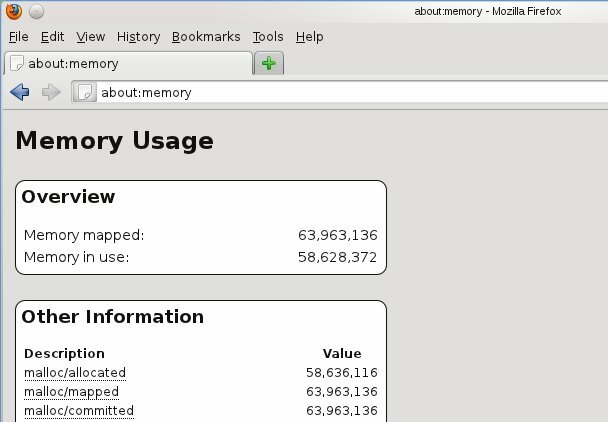 Since version 3.6, Firefox has the dedicated about:memory page, which tells you the exact memory usage statistics for your browser, so this is nothing new or specific to Firefox 4. But since we're talking about Firefox, and I have not introduced this feature previously in between my Firefox 3.5 testing - known then as 3.1 - and now, there's a good chance to gloat. 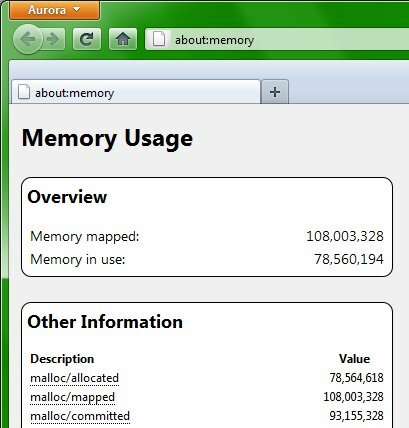 You need not do any fancy math and cross-reference data structures in the kernel, you let the browser calculate its own virtual memory space and report back. The simplest exercise is to let your browser work and log the usage figures every few hours. If there's a trend, you're going to see it. Try running on idle or with a very small number of tabs open, then expand to numerous tabs, then go back to a single page and let it simmer. If there are any, memory leaks will show up. You might want to read more about Firefox 4 in my extensive beta review; a few things have slightly changed since, but the majority of findings holds true. Moreover, there's a detailed comparison to Internet Explorer 9, if you care for that kind of stuff. Well, just so you kind of know where you're standing. Lastly, if your browser is slow, you might want to check some of the common troubleshooting tips. Mozilla also recommends you take at the list of extensions slowing down your browser startup, if you suffer from such a symptom. Do not take the numbers at face value and sure do not add the numbers up, as you will end with a negative startup time. Each extension needs to be evaluated on its own. There's also interaction, as well as a slew of other factors that might be influencing the browser performance. So take it easy. There we go. Hopefully, after you're done reading this article, your browser will be safer, smarter and more visually elegant. You now posses new tools to make your WWW thingie behave, including backup, trimming down errant windows, keeping a tight leash on the memory use, and managing the browser cache. If you combine today's lessons with the tips and tricks recommended in the first part, your Firefox 4 experience should be smooth, painless and even fun. In the coming weeks, we will talk about Firefox some more. I'm going to introduce Aurora, which is the sort of adventurous future preview of what Mozilla has in store, as well as debate the whole quick release cycle phenomenon, which seems to be gripping the browser makers. 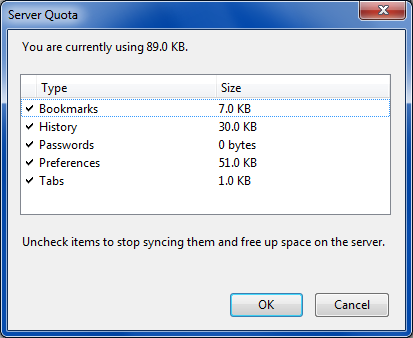 Chrome seems to be dictating the pace, but is this a good thing? Well, you'll have to wait for my rant.